The freestyle round is a timed, freeform competition that is judged on a 40 point scale using the following four categories, as described below: Dog, Human, Team, and Overall. Catch ratio will also be tracked as described below, but will not form a part of the freestyle score and but may be used only as a tiebreaker. The Dog category scores the performance of the canine member of the team. Some of the elements used for deciding the dog's score are focus, prey drive, excitement, willingness to cooperate with the handler, speed, endurance, jumping ability (both aided, e.g., using the handler's body as a launch pad, and unaided), and body awareness displayed by control in the air and landing properly. The dog's ability to catch a disc while in a variety of positions, at varying distances, and in varying directions can also enhance the dog's score. The Team category scores both the dog and the human in their performance as a team. Judges are looking primarily at the overall cohesiveness of the team and the communication between dog and handler. 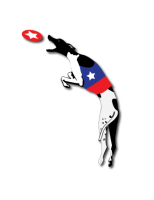 Some of the elements used for deciding the team score are the flow of the routine, disc management, field management, innovation, and creative and effective use of multiple discs for fast-paced throws requiring the dog to change direction, move quickly, and communicate with the handler. 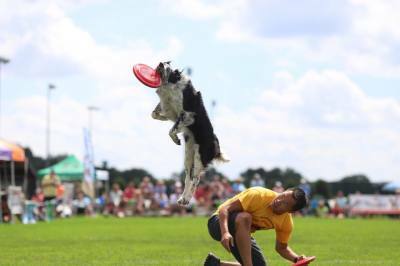 Chaining throws together with a succession of different tricks and moves involving the dog and the disc will also enhance the score. A routine should flow smoothly without long pauses between sequences to collect discs or for other purposes; however, brief pauses in flow to accommodate the setup for extremely difficult tricks may not negatively affect a team's score. The Overall category is a catch-all category used to score the overall impression given by a routine and to take into account other factors that may not be adequately scored under the other categories. Some of the elements used for deciding the overall score include crowd appeal, energy level, excitement, "wow factor," showmanship, and effective showcasing of the abilities of the dog, the human, and the team. Interpretation of the music, artistic impression, and production may also enhance the score. The Catch Ratio is a mathematically determined number that is obtained by dividing the number of catches by the number of throws, multiplying by 10, and then rounding to the nearest tenth of a point. For example, (22 catches) / (30 throws) * 10 = 7.3333, or 7.3 by rounding to the nearest tenth of point. Judges can be asked by a copmetitor, prior to their round, to write a few short notes or suggestions in regards to their round on a comment card, that must be provided by the competitor for the benefit of the competitor. Competitors may not request comment cards for other handler´s routines. The freestyle competition will be judged by a panel of four judges. Three of the judges will each be responsible for judging one of the three subjective categories in the AWI Freestyle Scoring System: Dog, Human, and Team. Catch Ratio will be tracked by the fourth judge. Each judge, excluding the catch ratio judge, will also give a score for the Overall category. The high and low Overall scores will be dropped and the remaining score will be the final Overall category score. Each category is scored on a scale from 1–10 in 0.1 (one tenth) point increments. The Dog, Human, Team, and median Overall score will be added together to determine the team's final score for the freestyle round. Catch ratio will not be added into the overall score, and will be used only as a tie breaker. Therefore, a very difficult routine with a lower catch ratio can potentially score higher than an easier routine with a very high catch ratio. Only moves that begin with the disc in flight and end with a catch are scored. Takes—moves in which the disc is handed off to the dog—will not be scored. Rollers—throws that are intentionally rolled along the ground to the dog—will be scored, provided the dog makes a clean catch. Moves such as taps and double throws in which one or more discs are intentionally missed by the dog and caught by the thrower will be scored, provided they are cleanly executed. The welfare of the dog is of paramount concern to the judges and sponsors. Therefore, vaulting a dog excessively high, or repeatedly, will not increase the likelihood of a higher score and may result in point deductions and/or disqualification. Judges have the option of writing a few short notes or suggestions on comment cards for the benefit of the competitor. Point deductions will be discussed as necessary by all judges at the end of the routine and only if all 3 judges are in agreement. Deductions will be reflected in the final score. Judges should also make the competitor aware if any deductions were applied at their earliest convenience, but definitely before their next round of Freestyle , so adjustments can be made if necessary to prevent any further deductions. Contortion: when a canine twists its body to a degree which could lead to injury while jumping, catching or landing. Buckle/Slam: an unstable landing during which a part of the canine's body other than the feet lands on the ground, except when a canine's face touches the ground due to chasing a low throw or similar situations. Competitors starting their routines with more than 9 discs will receive a deduction of minus one point applied to the Human Category. Players are performers. Your overall performance can and will be partially judged by how you conduct yourself once you enter and exit the field of competition. Conduct on the field before, during, or after a freestyle round which is perceived by a judge as inappropriate or unsportsmanlike may negatively affect your freestyle score. The freestyle field will consist of an open area of at least 30 yards by 50 yards. It will have an entrance and exit area that should be used by all competitors during the competition. Each competitor is expected to report to the on deck area when they are announced to be "on deck" and the next competitor up. Please do everything possible to ensure you are at the proper area before the round ahead of you is done, to ensure the event flows smoothly. Freestyle routines have a time limit of 120 seconds, or two minutes. Time will start when the first disc is released in an obvious throwing manner. Once time has begun, countdown of time remaining will be given at one minute, 30 seconds, 10 seconds, and time. Each team must perform for at least 90 seconds after time begins for their round to be scored and counted. Competitors are strongly encouraged to limit their pre-routines to less than 15 seconds. A maximum of nine discs may be used during any freestyle routine. Competitors starting their routines with more than nine discs will receive a deduction of minus one point applied to the Human Category. Competitors must bring their own music and should present it to the AWI sound system staff before the competition starts. Competitors must mark their music clearly with their name and their dog's name and list the track number to be played, if applicable Competitors are encouraged to avoid music that is not suited for a family audience. Music that is vulgar and contains foul language is inappropriate. If you have any questions regarding the appropriateness of your music, check with the AWI staff before competition starts. Music must be presented as a CD, MP3 file, or on a cell phone. Many event hosts will ask for a digital copy of your music in advance. Check with the event host for their preference. At the World Championship event competitors are required to wear the provided AWI t-shirt while competing. At AWI qualifiers there are no clothing restrictions in competition, however, the use of a costume will not increase the likelihood of a higher score if it does not add to the overall entertainment value and crowd appeal of the freestyle routine. Competitors should be aware that use of a costume could actually result in a lower score if it hinders the successful execution of moves or disrupts the flow of the routine. Any costume that the head judge deems to pose a risk of injury to the dog will not be allowed during the competition. Canine costumes should be limited to bandanas or form-fitting coats, like Ashley himself used to wear. Any loose, flowing, or hanging costume on a dog that the head judge deems to pose a safety risk will not be allowed on the field. The use of any type of prop—an item not worn on the body as clothing—is not permitted while the competing team is on the field. This rule applies regardless of whether the prop is used as part of a pre-routine (before time starts) or otherwise. If a competitor has a question regarding a costume or prop, it is highly recommended that the competitor consult with the judges in advance.